A Review for StellarCleenz 99.99% Silver Hand Cloth. In response to a call for a try-and-review of a new product at Barefoot Healing – an Australian company selling grounding or earthing products as well as other complementary wellness items. I was lucky to be selected and the pack arrived just at the right time. About to go away, so a few weeks in and out of airports etc. And the constant worry about germs and catching something. Who wants to get sick when you’re on holiday, right? Love that it comes with a well-designed and practical pouch. It can fit into any purse or pocket. Love that it is so easy to use and convenient. Love that it is supported by science and research. 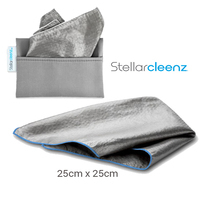 Stellarcleenz® is an innovative natural anti-microbial 99.99% Silver Hand Cloth used as an alternative to alcohol-based body sanitizers, wipes and gels. Stellarcleenz® is not only better for you to use, it it’s also light and small to carry, does not need to be replaced continually and leaves no mess behind. Stellarcleenz® is a fresh way to tackle our everyday germs in a healthy and environmentally friendly way and you won’t want to leave home without it!